With over 1200 pupils and 240 staff from Scotland and around the world, the community here is as welcoming as it is vibrant. From the Prep School to the Board of Governors, our people have built an environment that’s truly a joy to be part of. Joining us in August 2010, Mr Knapman initially expressed mild concern at being the thirteenth Rector – until a class of Prep School pupils pointed out that there are thirteen letters in Dollar Academy and that this might be a lucky omen. A former pupil of Dunblane Primary School and Morrison’s Academy, he played rugby and cricket against Dollar as a boy (not that we hold that against him, of course). Holding an M.Phil in Education from the University of Exeter, Mr Knapman joined us from Hampton School in south-west London, where he taught mathematics for ten years, latterly becoming Deputy Headmaster. No stranger to the lectern, he has delivered national seminars on pastoral and cyber issues at HMC and ISBA conferences. Working closely with charities such as SHINE and ISSP in London, Mr Knapman has been a big part of setting up educational support programmes for disadvantaged youngsters. He is also a trustee of HMC Projects in Eastern Europe. We are governed by a board of elected members. Our Governors include a wide range of representation, including individuals from our parental body and former pupils. Professor McEwen joined the Board in 1994, originally as the University of Glasgow elected Governor. He has been Chair of Governors since 2015. He initially entered General Practice, but then moved into academic public health and has held posts in the Universities of Dundee, Nottingham, London and Glasgow. He was appointed to a Chair in Public Health at Kings College, London before moving to the Henry Mechan Chair of Public Health in the University of Glasgow. He is now Emeritus Professor in Public Health and has undertaken consultancy work for WHO, the British Council and other international universities and organisations. His interests lie in public health regulation, health services research and measures of outcome in health care. After winning a scholarship to Dollar, Jacqueline Smith went on to study at Oxford. Now an Executive Producer at BBC Television, she makes factual programmes such as ‘Horizon’ and ‘Trust Me, I’m a Doctor’. Her work has reached audiences that number in the millions and has won several awards, including BAFTA and RTS. She is also the founder and director of an independent video and events production company. She joined the Board in 2009 and is currently one of the Vice-Chairs. Professor Morris is currently Bishop Wardlaw Professor of Chemistry at St Andrews. He also holds a joint position at the Charles University in Prague. He is a Fellow of the Royal Society (FRS), the Royal Society of Edinburgh (FRSE), the Learned Society of Wales (FLSW), and the Academia Europaea (MAE). He has been a Governor at Dollar Academy since 2000 and is currently one of the Vice-Chairs. After working in the City for various merchant banks Mr Buchanan left London to take over the family hotel business in North Yorkshire. He also founded a renewable energy business and, since 2013, has been running an engineering business that funds, installs and operates large scale industrial biomass boilers for various blue-chip companies. The company is also pioneering community district heating using forest waste. He was elected to the Board in 2015. Mrs Burt’s early career was as a Physical Therapist specialising in severe neurological trauma. Latterly, she was a co-founder of an expert witness company. She was, for a time, the DAPA representative and has insight, as a parent, of both the day and the boarding experience at Dollar. As a health professional her focus has been the promotion of wellbeing. She joined the Board in 2002. Following a distinguished career as a solicitor and Solicitor Advocate, Mr Frazer was admitted to the Faculty of Advocates in 2012. He currently acts as Advocate Depute to the Crown Office; Legal Assessor for the Nursing & Midwifery Council, General Teaching Council Scotland and the Certified Institute of Management Accountants; Support Counsel to the Scottish Child Abuse Inquiry; and Disciplinary Panel Chair for Cricket Scotland and Scottish Gymnastics. He was elected to the Board in 2015. Mr Glasgow is an Investment Director, responsible for managing discretionary and charity portfolios. He has over 20 years of investment experience, and is an Associate of the Society of Investment Professionals. Prior to his career in finance, he was a professional rugby union player with the Scottish Rugby Union. He was elected to the Board in 2011. Rev Goring is a Church of Scotland minister, ‘semi-retired’, but currently looking after the linked congregations of Dollar, Glendevon and Muckhart. He joined the Board in 2015. Mr Harris managed his own accountancy business in Glasgow. When he joined the Board in 1969 he was the elected Glasgow Club Governor. He went on to serve as Vice-Chair for more than 25 years, and is now a co-opted Governor. Mrs Heath has worked mainly in finance and IT project management and in both the private and public sectors. She is now training to be a yoga instructor. She was elected to the Board in 2015. Dr Jackson is a long time Dollar resident and has previously chaired the Strathdevon Primary School Board. After many years of public service in various roles he now works as a Clinical Psychologist within the NHS. He was elected to the Board in 2018. Mr Kitson was Head of House, McNabb Boarding House, during his time at Dollar. He was elected to the Board in 2017. Mr Mason is a retired Architect, and is currently the elected member of Clackmannanshire Council for the East Ward (Muckhart, Dollar & Clackmannan). He has a particular interest in education, and is an advocate for the Voluntary Sector and strong supporter of youth organisations including the Duke of Edinburgh’s Award, the Cadet Forces, the Boys Brigade, Scouts, Guides, and many other organisations for young people. He was elected to the Board in 2017. Mr Milne served in the Royal Navy for 24 years commanding HM Ships Chaser and Spey. Thereafter, he flew public transport helicopters on the North Sea and also served as an elected British Airline Pilots Association representative, and chaired the BALPA Helicopter Affairs Committee for several years before retiring in 2015. He has been a Governor since 2008. Dr Pentland is Reader in History at the University of Edinburgh. He is a graduate of the Universities of Oxford and Edinburgh and specialises in the history of British politics and culture since the late eighteenth century. He was elected to the Board in 2017. Dr Weir is a former oncology and radiotherapy specialist and is currently the elected DAPA representative on the Board. She has had a long standing association with the school, as a parent. She was elected to the Board in 2011. Mr White is a Director of the family firm of John White & Son (Weighing Machines) Ltd, Scotland’s oldest family business, founded in 1715. He is a Board Member and Office-Bearer of the UK Weighing Federation, and Chairman of Daima Energy operating in Scotland & East Africa. He is also a Fellow of the Institute of Directors. He was elected to the Board in 2012. Dr Wilson lectures in Mathematics, specialising in Algebraic Geometry, and with a keen interest in the learning & teaching of Mathematics. He was elected to the Board in 2018. Mr Walker is an Architect and environmentalist who has worked in the UK and Oman during his career. He was appointed Architect Adviser to the Board in 2012. Geoff Daniel is the Deputy Rector, responsible for the everyday running of the Academy and with particular responsibility for boarding. He also teaches some English and Religious Studies classes. Educated in the Universities of St Andrews and Durham, he trained in Hamilton College of Education, and spent his early years as an English teacher in Glasgow comprehensives, before moving to Kamuzu Academy in Malawi, where he was a Housemaster and the Head of Drama. There were subsequent years in Glenalmond College, Perthshire and Reed’s School, Cobham (where he was Head of English and Head of Sixth Form) before he moved to Dollar in 2000 as Deputy Rector. Outside the Academy, he is a Justice of the Peace, sitting in Perth, and the Poetry Advisor to the Association of Christian Writers, having written and published for over 40 years. He is married to Iseabal, a former teacher of children with autism, and their two children are both FPs of Dollar. Simon Burbury completed the National Professional Qualification for Headship from the National College of School Leadership before becoming Assistant Rector at Dollar Academy in January 2015. His role is predominantly in the guidance area with specific responsibility for pupil wellbeing and child protection. He also oversees Forms IV-VI. After gaining a BA (Hons) in Music Performance at the Royal Conservatoire of Scotland and a Masters Degree in Music from Lancaster University, Simon gained his teaching qualification from Homerton College, Cambridge University. 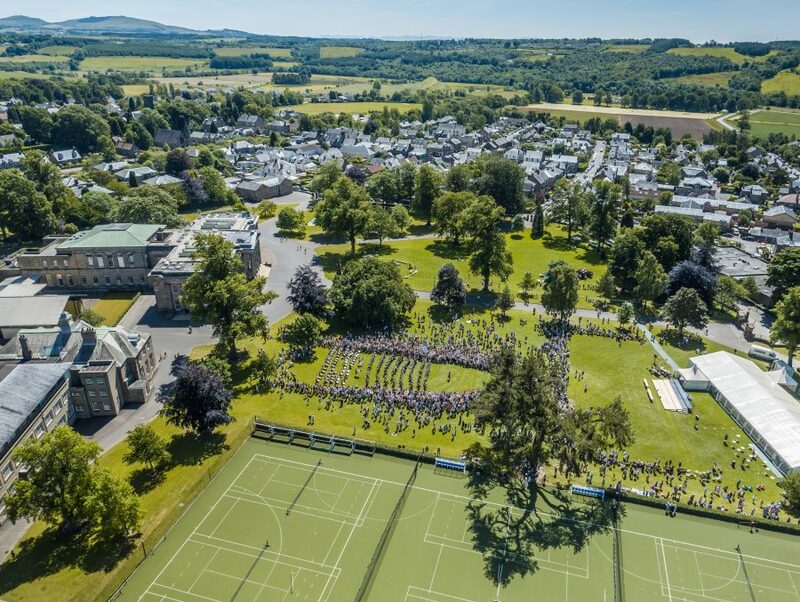 Following stints as Director of Music at schools in Egypt and Singapore, his family returned to Scotland when he was appointed Director of Music at Gordonstoun. Simon contributes to our music department whenever he can and is a Sub-Lieutenant and dinghy sailing instructor for our CCF Royal Navy Section. He set up our very valuable annual trip to Romania to help disadvantaged and disabled children at Little John’s House. Robin Macpherson joined Dollar in 2017 and he and his wife Hossa are House Parents in Heyworth House. He has overall responsibility for teaching and learning, health and safety, and data protection. He studied History at Oxford and Edinburgh Universities, and was previously Head of History and Professional Learning at Wellington College in Berkshire. He was Content Director of the Telegraph Festival of Education, and co-authored the very successful book ‘What Does This Look Like In The Classroom?’. He has written a number of textbooks for Cambridge University Press. He speaks and writes about education issues and is an organiser of researchED Scotland. He is also a board member of the educational charity Remembering Srebrenica Scotland and leads regular pupil trips to Bosnia. Karen Miller joined Dollar Academy in August 2015. Her teaching career has taken her to schools across the UK: in both boarding and day schools, from the ultra-orthodox to the strictly non-denominational. Always passionate about education beyond the classroom, she has led pupil expeditions to Poland, Honduras, China, Vietnam and Antarctica. She has extensive experience as a Head of Geography and Head of Year. As Assistant Rector, she is responsible for curriculum, tracking and monitoring and reports. She is the SQA Head of Centre with oversight for all external and internal examinations including prelims and the post-results service. She oversees guidance matters in Form III year and provides subject choice information for all year groups at key points in the Senior School. Alison Morrison was appointed Head of the Prep and Junior School, and Assistant Rector, in 2010, having joined Dollar Academy in August 2006. She also plays a significant role in Admissions and has overall responsibility for Form I. Born in Edinburgh, she grew up in Northamptonshire and read Economics at Jesus College, Cambridge. A career in the City beckoned and she was a bond salesperson for a Japanese Bank for four years before switching to marketing and advertising, initially with Thames Television and subsequently with Grey Advertising. Following a year in Vancouver, her family returned to their roots in Scotland and her two sons were enrolled at Dollar Academy. Inspired by their experience at Dollar she trained to be a Primary Teacher at Moray House, University of Edinburgh, and after two years in local schools joined the Junior School as a teacher in Junior 1. Justin Wilkes read Modern Languages at Oxford before embarking on his first career in the Royal Navy, serving in the UK, at sea and overseas. He joined Dollar in 1994 and is responsible for all non-academic aspects of the school including finance, campus development, and legal matters. He assists with Duke of Edinburgh expeditions, and has previously been involved with the CCF, run modules in Italian, and assisted with English Advanced Higher dissertations. We have around 250 staff here on campus. All of our teachers are fully qualified and GTC registered. Many bring valuable experience from backgrounds in other fields such as commerce, professional sport, music and research. The Dollar Academy Parents Association exists to make sure the collective parent body has a voice in any matter pertaining to the school and the Governors of Dollar Academy Trust. The Board of Governors always includes a committee member from DAPA, Mrs Debbie Weir being the current representative. In addition to its formal duties, Parents Association always has a presence at the major school events and hosts a number of social events, a great way for parents to meet and to chat. All parents are welcome to get involved and can contact Parents Association by email at dapa.dollaracademy@gmail.com.